The Gospels record vivid examples of Christ the healer as he cured people and revealed the healing love and mercy of God’s kingdom: “the blind regain their sight, the lame walk, lepers are cleansed, the deaf hear, the dead are raised” (Matthew 11:5). At this morning’s 27th annual Rose Mass at the Church of the Little Flower in Bethesda, the Church of Washington invokes God’s blessings on the medical, dental, nursing and allied health care workers and many health care institutions that bring Christ’s healing to our own community. 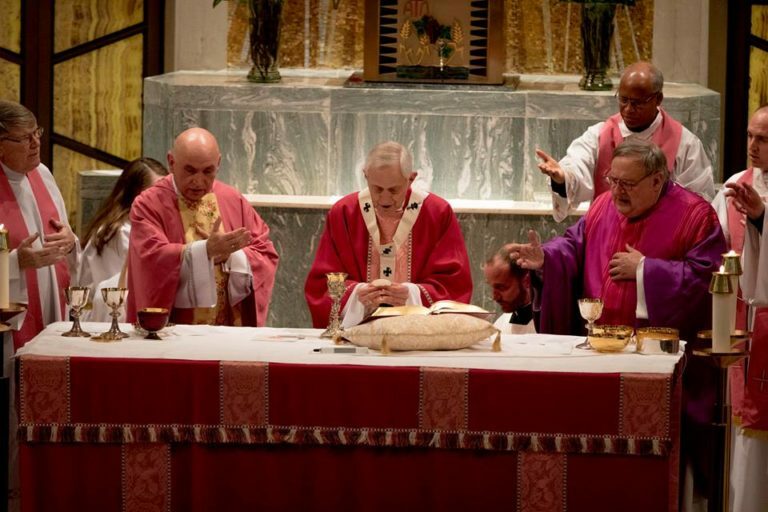 The Mass gets its name from the rose-colored vestments worn on Laetare Sunday, the fourth Sunday of Lent, with the rose also symbolizing life, which is entrusted to the care of these dedicated men and women. Especially for a disciple of Jesus in the healing professions, medicine is more than a job. It is a vocation, combining the science of medicine with Christian charity and reflecting in their daily work Christ the healer. It is God’s mercy and love at work among us and in us through human hands, words, actions and hearts. This liturgy is an opportunity to pray for and say in a small way, “Thank you,” to these care givers. Adding to our prayerful gratitude, after Mass the John Carroll Society presents Pro Bono Health Care Awards, which specially recognize volunteers from the Catholic Charities Health Care Network. This program of the good works arm of our archdiocesan Church has nearly 200 volunteer doctors, dentists and other specialists, who along with participating hospitals and clinics served over 5,200 poor and uninsured patients last year, providing about $10.7 million in free care. Yet that is only part of all the good our Catholic family provides in health care. Every day, other providers in the Archdiocese of Washington bring Christ’s healing to people from every socio-economic and cultural background. Through Catholic hospitals, clinics, emergency rooms, specialty offices and community outreach, our family of faith offers in particular a safety net for many who are on the margins of society, combining world-class care of the body and mind with the love, compassion and caring of Jesus which treats the spirit as well. At a time when our society continues to threaten to erode freedom of conscience and religious liberty, these Catholic health care professionals and institutions bear witness to the God-given dignity of human life in all its stages. As we celebrate the Rose Mass and offer prayers and thanks for those working in Catholic health care, we must continue to stand strongly for the religious freedom that allows them and us to be true to what we believe, and true to who we are as Catholics and as Americans, called to bring Christ’s love and healing to others.